A murine monoclonal antibody to human C4d containing fragments. 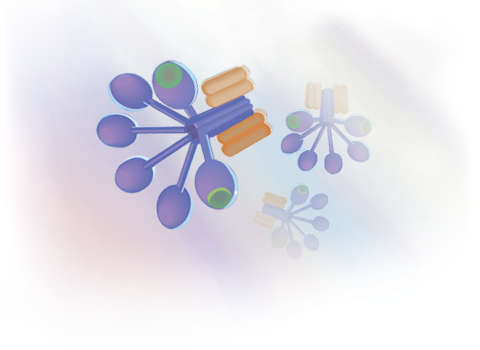 This monoclonal antibody was raised against purified human C. It is specific for an antigen expressed on the C4d domain of C4 and therefore reactive to C4 and all C4d-containing fragments of C4. Quidel's C4d monoclonal antibody has been used in a variety of experimental techniques including EIA, Western Blot, Flow Cytometry and Immunohistochemistry. Please contact Quidel Technical Support for details on these or other applications. Rogers, J., Cooper, N., et al. Complement Activation by ß-amyloid in Alzheimer disease, PNAS 89:10016-10020, 1992. Schwab, C. Steele, J.C. McGeer, P.L. Neurofibrillary tangles of Guam parkinson-dementia are associated with reactive microglia and complement proteins, Brain Res. 707(2):196-204, 1996. Gemmell, C. A flow cytometric immunoassay to quantify adsorption of complement activation products on artificial surfaces, J Biomed Mater Res 37, 474-480, 1997. Solzner, S., Lemerre, C. et al. Temporal accural of complement proteins in Amyloid plaques in patients with Down syndrome with Alzheimer's Disease, Am J Path 156:489-499, 2000.